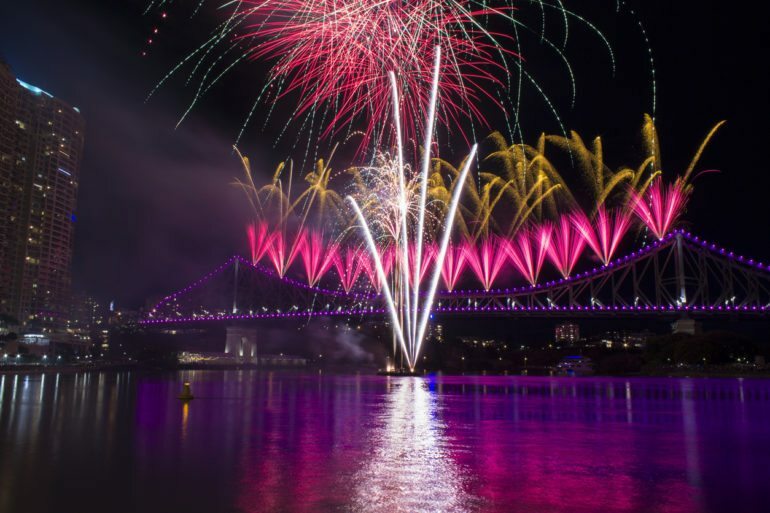 Brisbane knows how to party, and if you’re spending New Year’s Eve here you’ll have plenty of choice in ways to while away the hours until the countdown. Will you jump on a river cruise, hit the clubs or glide above the city? Here are some of the most distinctive and unforgettable options for your celebrations. The main event is of course the epic firework displays going off over the huge South Bank crowd at 8:30pm and midnight. From our Herschel Street suites it’s easy to walk straight across the Victoria or Kurilpa bridges to the South Bank celebrations, or watch from the bridge themselves. Our Adelaide Street suites place you closer to Eagle Street Pier, which offers a great vantage point and access for those with limited mobility. Looking for something truly unique for family or friends? Book a private gondola on the iconic Wheel of Brisbane and secure a prime viewing spot as you journey around this huge Ferris wheel. You’ll be able to relax with a beer or a cider as you gently curve throughout the sky and take in the glittering lights above the city. If you’d prefer to get active on the last day of 2017 then join Riverlife’s NYE Paddle & BBQ. You can paddle your way along the water on an illuminated kayak trip, then sit back and enjoy a gourmet barbecue, drinks and dancing on the riverbank until the early hours. Be quick – this experience sells out every year. If you feel like escaping the city over New Year’s Eve then make your way to Woodford Folk Festival, located just 70-odd clicks north of Brisbane. It’s a wild musical world here and a special place to be on New Year’s Eve, with three minutes of silence leading up to an exuberant celebration at midnight plus a sunrise welcome to 2018. Get your glad rags on for the black-tie Queensland Pops Orchestra NYE Gala Concert at QPAC, complete with tenor Rosario La Spina, soprano Katie Stenzel, and violinist Cherin Lee. Directly after the evening’s two performances, Black Tie Package holders will enjoy canapes and champagne on the rooftop with a view of the fireworks. Meriton Suites has central suites in Brisbane city that are ideally placed for your New Year’s Eve celebrations. And here’s a hot tip – direct reservations are always guaranteed the best rates!